I play it. As I recall, some of this forum's members were surprised at the final price, and had assumed it would go too high and didn't bother to bid--to all of you--Thanks! Lovely guitar, you are in good company as Washboard Chris on here has also recently got a lovely sq neck fiddle edge, a few of us have less fancy ones but they are a lot of fun. That is a beautiful guitar. You struck lucky there! 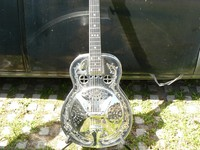 Square neck guitars, apart from popular Dobro models and cool looking electric lap steels are not easy to sell. 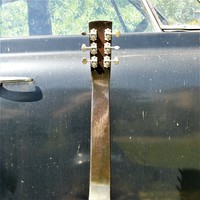 The dent from a flying steel is so common on square neck metal guitars. On wood guitars it tends to chip the lacquer, which isn't quite so bad. It happened to me once clearing up after a performance. The steel (I use a round Hawaiian bullet steel) was on a chair and my guitar was lying in its case next to the chair, but the case was open, and of course the steel rolled off the chair onto the guitar. I'll never do that again, nowadays I always leave a 'steel drop gap' between the chair and the case! We live and learn....hopefully. 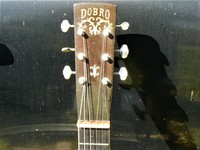 As a point of interest, the headstock inlays on your Dobro are very similar in style to the inlay on the Harry Watson Style 4 Tricone that I used to own. bizarre playing added a certain something to the already odd music our band was coming up with. The tailpiece on the fiddle edge I could live with if it were nickel instead of chrome--but I have found an intact original in which the very top part had been cut away, and a broken one with a perfect top. 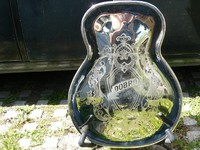 A friend is going to join the two together to create a Frankenstein tailpiece. it was engraved all over). I foolishly waited as although I had the $225, I felt guilty as my wife was the only one working at the time--I was a musician! Hi Mendax, although you might not have been 'working' I'm sure you were composing stuff in your head all the time! Good Karma. Nice one! Happy playing.